Games are not all about jaw-dropping graphics and adrenaline-packed shooting. They are also about creativity, non-violent fun and adventure. And Draw a Stickman, the new Android game by Epic brings just that with a twist of surprise in the form of a different gameplay. Draw a Stickman starts with you drawing a stickman (duh!). What happens next though is a lot of fun. Epic animates your character so it can walk around a virtual drawn world which you change by sketching on top of it. See a wooden door you can’t go through? You just draw a fire and it burns down. 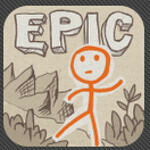 That’s the innovative kind of an adventure game that Draw a Stickman is. You have a free trial on Google Play, but the full version costing you just a buck comes with 13 different levels. The story revolves around you trying to save your best friend you have just drawn who’s just been eaten by an evil book. Best of all, the gameplay is not linear. Why would you buy the "fool" version? Editors seem to be sleeping on the job. I think Bigfoot is doing the drawing in the video.